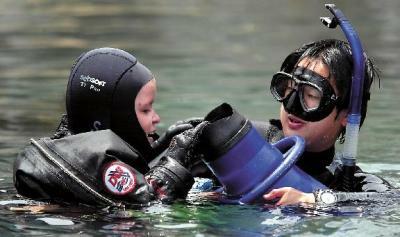 His project at the Monterey Bay Aquarium hooks up disabled kids with a diving experience – how cool! With this wonderful experience with these special kids, Adam can help daddy dive for abs up in Mendo on Father’s Day weekend! This wonderful experience with special kids means that Adam can help daddy dive safely for abs up in Mendo on Father’s Day weekend! Adam, what was the kid looking at down there?